Owen and Dorthea McCoy in 1991. David '66 and Debra McCoy, son and daughter-in-law of Dorthea and Owen McCoy and benefactors of the scholarship. Dorthea McCoy was named the Alliance school district’s first teacher of the year in 1964. She received her Bachelor of Arts degree in Education from Ohio University and a Master of Arts in Latin from Ohio State University. Dorthea and her husband Owen, moved to Alliance in 1948. She was a long time member of the AHS faculty retiring in 1977 as a French teacher and director of the district’s foreign language department. She also helped organize the Alliance chapter of the American Association of University Women and served as its first president. Owen was a Navy and Merchant Marine veteran. He was a photographer and high-speed cinematographer at the Babcock & Wilcox Company research center in Alliance and retired from there after 39 years. Owen and Dorthea were world travelers and visited every continent except Antarctica. Over the years, they hosted many guests from other countries in their home on Linwood Drive. Mr. McCoy died in 2000 at the age of 86. Dorthea passed away four years later at age 90. 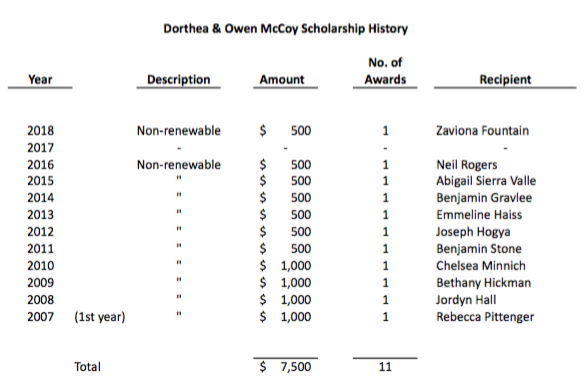 In 2007, their son David F. McCoy ’66 and his spouse Debra, who are retired journalists living in Lancaster, Ohio, endowed $11,500 for the establishment of this scholarship. It is to be presented annually to a graduating senior who has taken a minimum of five credits in a foreign language and who has maintained a superior work ethic and a successful academic record. Recipients shall be chosen by the faculty of the foreign language department.